KUDOS HYCC-050 Cutting of piano wire is prohibited. 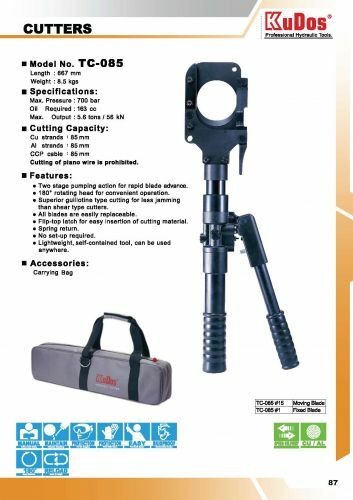 KUDOS HYCC-050 180˚ rotating head for convenient operation. KUDOS HYCC-050 Superior guillotine type cutting for less jamming than shear type cutters. KUDOS HYCC-050 Single stage pumping action. KUDOS HYCC-050 All blades are easily replaceable. KUDOS HYCC-050 Flip-top latch for easy insertion of cutting material. KUDOS HYCC-050 No set-up time required. 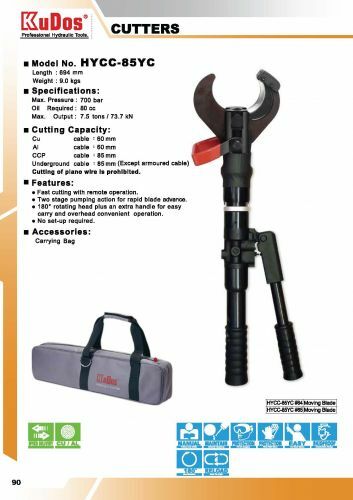 KUDOS HYCC-050 Lightweight, self-contained tool, can be used anywhere. KUDOS TC-085 Cutting of piano wire is prohibited. KUDOS TC-085 Two stage pumping action for rapid blade advance. KUDOS TC-085 180˚ rotating head for convenient operation. KUDOS TC-085 Superior guillotine type cutting for less jamming than shear type cutters. KUDOS TC-085 All blades are easily replaceable. KUDOS TC-085 Flip-top latch for easy insertion of cutting material. KUDOS TC-085 No set-up time required. 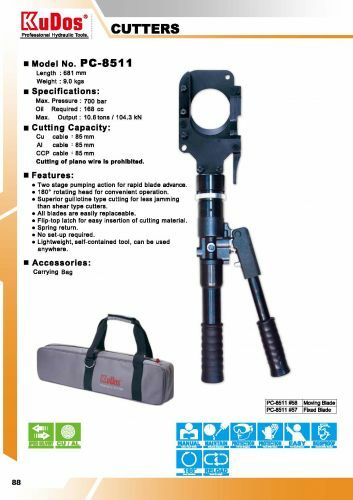 KUDOS TC-085 Lightweight, self-contained tool, can be used anywhere. KUDOS HYSC-32 Cutting of piano wire is prohibited. KUDOS HYSC-32 180˚ rotating head for convenient operation. KUDOS HYSC-32 Superior guillotine type cutting for less jamming than shear type cutters. KUDOS HYSC-32 Two stage pumping action. KUDOS HYSC-32 All blades are easily replaceable. KUDOS HYSC-32 Flip-top latch for easy insertion of cutting material. KUDOS HYSC-32 Single stage pump action with spring return. KUDOS HYSC-32 No set-up time required. KUDOS HYSC-32 Lightweight, self-contained tool, can be used anywhere. KUDOS HYSC-24 Cutting of piano wire is prohibited. 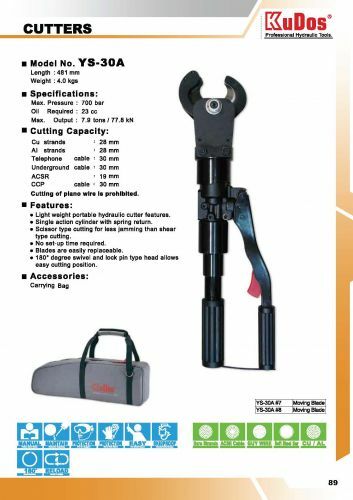 KUDOS HYSC-24 180˚ rotating head for convenient operation. KUDOS HYSC-24 Superior guillotine type cutting for less jamming than shear type cutters. KUDOS HYSC-24 Single stage pumping action. KUDOS HYSC-24 All blades are easily replaceable. KUDOS HYSC-24 Flip-top latch for easy insertion of cutting material. KUDOS HYSC-24 Single stage pump action with spring return. KUDOS HYSC-24 No set-up time required. KUDOS HYSC-24 Lightweight, self-contained tool, can be used anywhere. KUDOS S-24 Cutting of piano wire is prohibited. KUDOS S-24 180˚ rotating head for convenient operation. KUDOS S-24 Superior guillotine type cutting for less jamming than shear type cutters. KUDOS S-24 Two stage pumping action. KUDOS S-24 All blades are easily replaceable. KUDOS S-24 Flip-top latch for easy insertion of cutting material. KUDOS S-24 Single stage pump action with spring return. KUDOS S-24 No set-up time required. KUDOS S-24 Lightweight, self-contained tool, can be used anywhere. KUDOS S-24 One spare cutting blade can be storaged inside of the moveable handle. 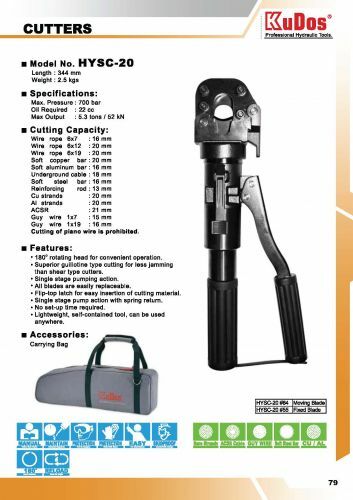 KUDOS USA HYDRAULIC CUTTERS HYSC-20.pdf. KUDOS HYSC-20 Cutting of piano wire is prohibited. KUDOS HYSC-20 180˚ rotating head for convenient operation. KUDOS HYSC-20 Superior guillotine type cutting for less jamming than shear type cutters. KUDOS HYSC-20 Single stage pumping action. KUDOS HYSC-20 All blades are easily replaceable. KUDOS HYSC-20 Flip-top latch for easy insertion of cutting material. 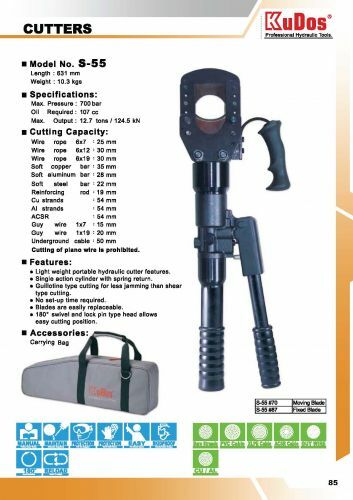 KUDOS HYSC-20 Single stage pump action with spring return. KUDOS HYSC-20 No set-up time required. 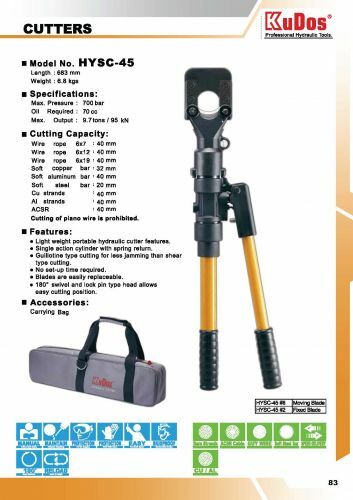 KUDOS HYSC-20 Lightweight, self-contained tool, can be used anywhere. KUDOS HYSC-45 Cutting of piano wire is prohibited. 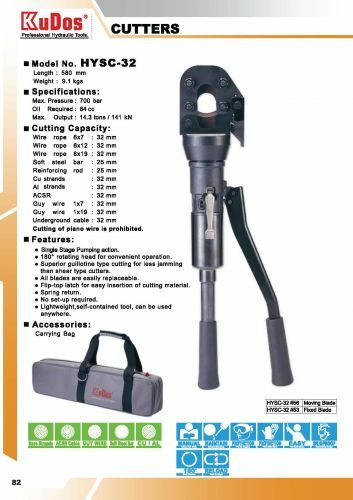 KUDOS HYSC-45 Light weight portable hydraulic cutter features. KUDOS HYSC-45 Single action cylinder with spring return. KUDOS HYSC-45 Guillotine type cutting for less jamming than shear type cutting. KUDOS HYSC-45 No set-up time required. KUDOS HYSC-45 Blades are easily replaceable. 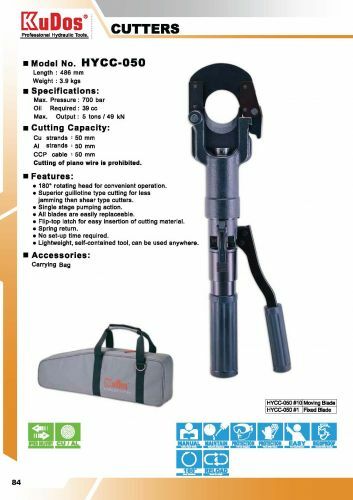 KUDOS HYSC-45 180˚ swivel and lock pin type head allows easy cutting position. KUDOS S-55 Cutting of piano wire is prohibited. KUDOS S-55 Light weight portable hydraulic cutter features. KUDOS S-55 Single action cylinder with spring return. KUDOS S-55 Guillotine type cutting for less jamming than shear type cutting. KUDOS S-55 No set-up time required. KUDOS S-55 Blades are easily replaceable. 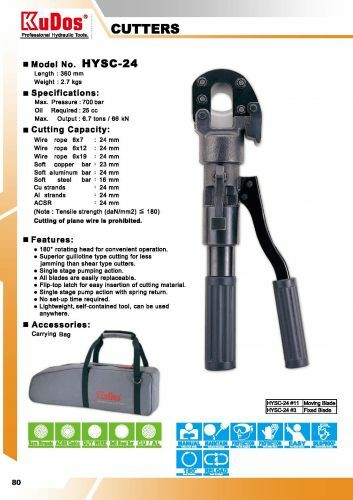 KUDOS S-55 180˚ swivel and lock pin type head allows easy cutting position. KUDOS HYCC-P85 Cutting of piano wire is prohibited. KUDOS HYCC-P85 Lock pin type cutting head. KUDOS HYCC-P85 Two stage pumping action for rapid blade advance. KUDOS HYCC-P85 180˚ rotating head for convenient operation. KUDOS HYCC-P85 Superior guillotine type cutting for less jamming than shear type cutters. KUDOS HYCC-P85 All blades are easily replaceable. KUDOS HYCC-P85 No set-up time required. 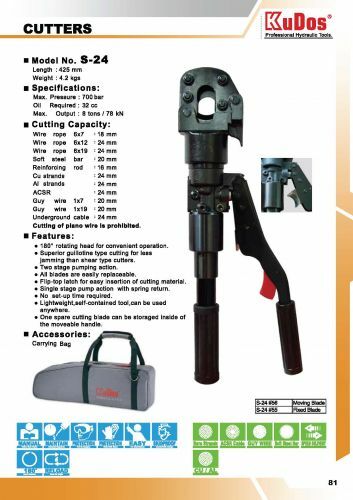 KUDOS HYCC-P85 Lightweight, self-contained tool, can be used anywhere. KUDOS PC-8511 Cutting of piano wire is prohibited. KUDOS PC-8511 Two stage pumping action for rapid blade advance. KUDOS PC-8511 180˚ rotating head for convenient operation. KUDOS PC-8511 Superior guillotine type cutting for less jamming than shear type cutters. KUDOS PC-8511 All blades are easily replaceable. KUDOS PC-8511 Flip-top latch for easy insertion of cutting material. KUDOS PC-8511 No set-up time required. KUDOS PC-8511 Lightweight, self-contained tool, can be used anywhere. KUDOS YS-30A Cutting of piano wire is prohibited. KUDOS YS-30A Light weight portable hydraulic cutter features. KUDOS YS-30A Single action cylinder with spring return. KUDOS YS-30A Scissor type cutting for less jamming than shear type cutting. KUDOS YS-30A No set-up time required. KUDOS YS-30A 180˚ swivel and lock pin type head allows easy cutting position. KUDOS HYCC-85YC Cutting of piano wire is prohibited. 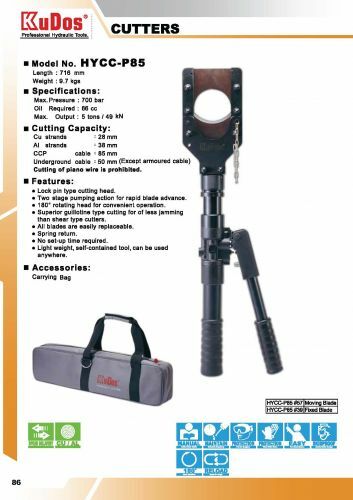 KUDOS HYCC-85YC 180˚ rotating head plus an extra handle for easy carry and overhead convenient operation. KUDOS HYCC-85YC No set-up time required.